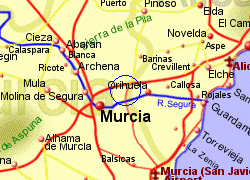 The large village of Santomera is located approximately 9Km north east of Murcia city and 11Km west of Orihuela. 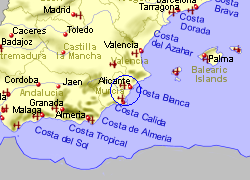 It is also 35Km from the Costa Calida and southern Costa Blanca coastline, lying within the fertile plains near the river Segura, only 35m above sea level, and is mostly surrounded by citrus fruit. The area is well known for its production of lemons. 6Km to the north lies the Santomera reservoir, built to protect the lower areas from flooding. 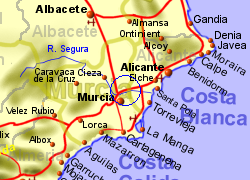 Map of the Santomera area.